SDM synchronous detector measures the voltage signal from the output of photodiode preamplifier and converts it to the DC voltage signal proportional to amplitude of voltage from input. • Three independent channels for detection. 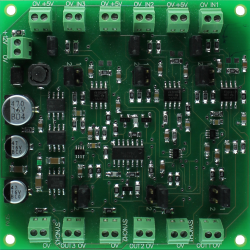 One can connect three systems with drivers and preamplifiers and run them through the synchronous detector simultaneously. • Built-in power supply for preamplifiers. • Possibility of input polarity inversion using the appropriate jumper. In case of wrong polarity connection from photodiode preamplifier one can simply switch the input polarity inversion jumper.